New book, 774 pages. No Englishman has made more impact on the history of his nation than Oliver Cromwell; few have been so persistently maligned in the folklore of history. The central purpose of Antonia Fraser's book is the recreation of his life and character, freed from the distortions of myth and Royalist propaganda. Cromwell was a man of contradictions and surprising charm. The ruthless Psalm-singing General of the battlefields was also a country gentleman who, after his victory at Worcester paused to hawk in the fields nearby; the stern Puritan was also an exceptionally doting father; the most decisive and ruthless of commanders was also the passionate connoisseur of music; the strong man of England was prey to exhausting prolonged bouts of irresolution and as Lord Protector kept England on tenterhooks for a week while he wrestled with his conscience whether to accept the Crown. 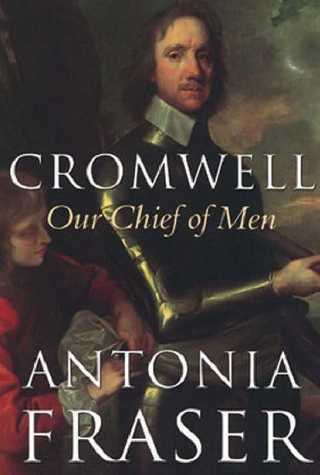 Of Cromwell's fitness for high office, both military and civil, this fascinating biography leaves no doubt. Under his rule English prestige abroad rose to a level unequalled since Elizabeth I. Yet - as Antonia Fraser's judicious assessment shows - his campaign in Ireland has cast a shadow over his reputation. As in all her books, Antonia Fraser combines a high standard of scholarship with a most exciting narrative. The result is a major biography in the finest tradition which displays great insight into this complex man and reveals a totally unexpected Cromwell far removed from the received stereotype. This item was added to our catalog on Friday 20 October, 2006.